The Evening Elephant is a high-level, forbidden taijutsu that can be performed by those users who have opened all Eight Gates. This technique is a continuous assault of five punches, with each "foot" as they are referred to being performed faster than the one before. It creates a cannon of pressurised air which bears the appearance of an elephant's leg, causing devastating damage to the opponent. 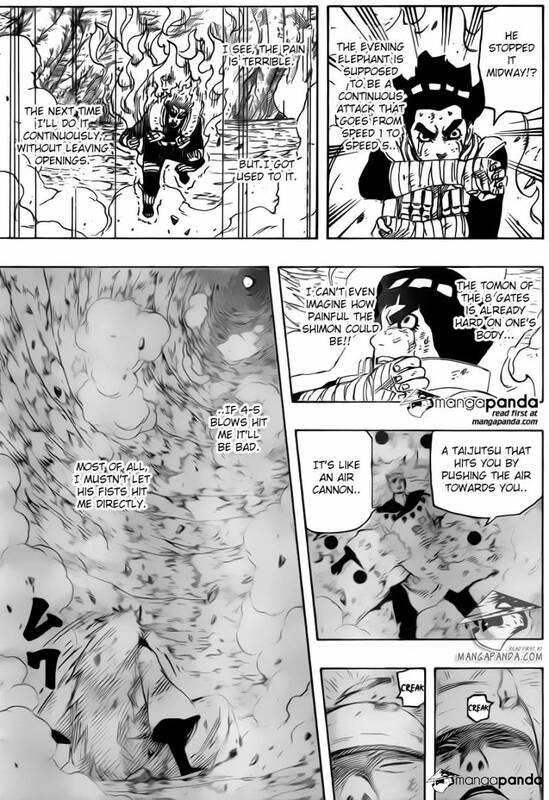 Why didn't Madara just absorb the air/wind from the attack? If it's a direct hit from the fist Madara may not be able to absorb it. This has been explained before, during the battle of Gai with Kisame. Kisame's technique absorbs chakra from the Ninjutsu technique and grows stronger while the opposite attack grows weaker, but it couldn't do anything about the Sonic Punch, Hirodora (Afternoon Tiger). This is because unlike nature manipulation techniques Gai's Gate technique utilizes pure Taijutsu. Rinnegan can absorb any and all Ninjutsu techniques, because Ninjutsu uses Chakra to achieve nature manipulation, whereas Gai's technique utilizes the speed achieved by the Gates to create the destructive power of his attack from the atmospheric air itself, and which can't be absorbed. Also, it is stated in the Manga that Madara in ten-tails Jinchuriki form only Senjutsu and Taijutsu work since he can absorb all Ninjutsu. The Rinnegan lets you absorb any ninjutsu technique. For elemental ninjutsu, you can absorb the chakra of the attack, therefore nullifying it. But since an air "cannon" isn't ninjutsu, there's nothing the rinnegan can do about it. Why didn't Madara use Izanagi to counter Kaguya? Why didn't Naruto's arm grow by itself like Madara or Kaguya?